Stephen Malkmus has released a new track, “Rushing the Acid Frat.” It’s the second single from his upcoming solo album, Groove Denied, following “Viktor Borgia,” which came out back in January. “Rushing the Acid Frat” is a slow-burning psych rock thrill ride, with more than a few nods to Sgt. Pepper. 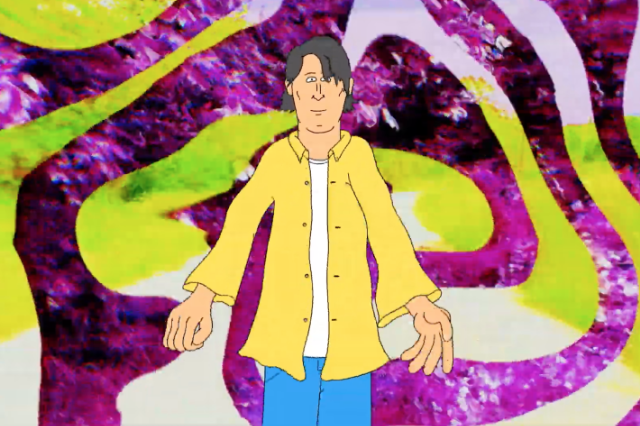 The suitably trippy music video features an animated incarnation of Malkmus strolling through Los Angeles, joined by a host of cartoon pals (a skater dog drinks a beer! a marine mammal rides a broken scooter! a purple moon wears sunglasses!). A press release reveals that title of the new song is a reference to a “specific frat” at the University of Virginia, Malkmus’ alma mater. Malkmus’ upcoming album has been in the works for a while now. Last May, in an interview with The Washington Post promoting his 2018 album Sparkle Hard, Malkmus hinted at the existence of an “electronic album” that had been rejected by his label in favor of a more traditionally guitar-centric Malkmus release. That original collection of tracks is now set to drop on March 15, with the fitting title Groove Denied. Read our review of last year’s Sparkle Hard here, and watch the video for “Rushing the Acid Frat” below.